Lord Lyon accepts ‘no. 30 a daughter who married John Gunn of Kinbrace’. As well, note the previous rough dates for marriage of the ‘Unknown Gunn’ who married John Gunn of Kinbrace; that being 1690-1710. Now the Gunns of Kinbrace are a fascinating option for the 'Chief' line. People have not paid attention to the Sutherland Estate papers for Gunn issues. Such papers are primary source material and so are totally reliable. Firstly there is the two volume Papers on Sutherland Estate Management 1802-1816 ed. by R.J. Adams, Edinburgh for the Scottish History Society 1972. This book points out that the story as to how the Gunns finally left Kinbrace is just wrong. The last Gunn of Kinbrace resigns the estate in 1814 (Volume 2, page 206-7) and he is described as ‘very inadequate’ (Volume 1, xlvi) and ‘Gunn is a Complete blunderbuss’ (Volume 2, page 207). Now, the normal line is summed up as ‘the rightful heir was tricked out of his wadset’ which is from Mark Rugg Gunn page 187, and reflects the tenor of the story in Sinclair as well. As said, the Sutherland Estate papers just show that version to be wrong. Now, many have tried to squeeze family trees based on this wrong – and incomplete - story. I note the Gunn line here is that which became ‘Leveson Gower Gunn’, the last of whom was a Chief claimant in the late 1960s. I believe that line to be extinct. It is worth noting that the Papers on Sutherland Estate Management 1802-1816 refer to this lease / wadset as being for ‘Kinbrace, Shinachy, Achneakans and Achnahow’ so all of these places have to be considered, but the event is too late for the John of Kinbrace who marries ‘Unknown’. 3) It’s giving the rights to Kinbrace and Achanow back to the Sutherland estate. 4) The date 1714 is on the back cover. So ‘Kinbrace’ now also applies to the Gunn line which has ‘William - Adam – William’; and a John. There is only one known line which has this. That is the line from Donald the Scholar called ‘Mulbuie / Mealbuie (and other such variations)’. And it also has one of them marrying a Sutherland. Again, if one considers the ‘story’ about how Gunns ‘lost’ Kinbrace it doesn’t work for this family line either. I note there is a further Kinbrace line from George Gunn in Borrobol but the John Gunn in Kinbrace from this line has a circa birthdate of 1710 (and a brother George Gunn in Achanua) and so is too late to be the John Gunn who marries the Chief’s daughter. I suspect they take on the wadset after Donald the Scholar’s line, but then pass it on probably to those who give it up in 1814. 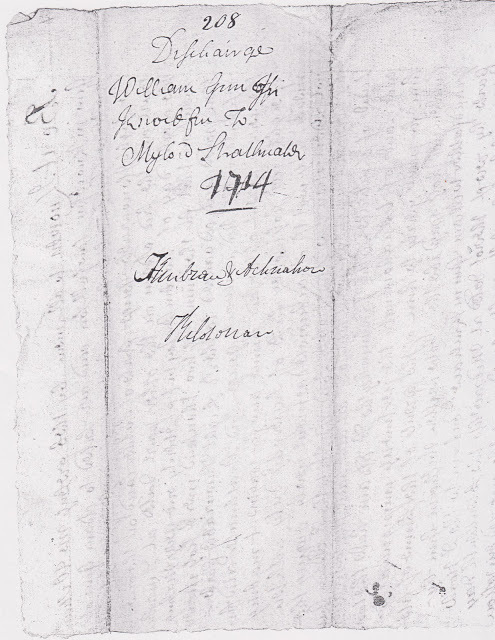 1) Primary source document of the time gives William – Adam – William as ‘of’ Kinbrace up to 1714. 2) The ‘Unknown Gunn’ who marries the John Gunn in Kinbrace line does so somewhere 1690-1710, the period this family held the lease. 4) It also has a John of the right time. 5) And descendants are known – and alive - from this line and are discussed elsewhere on this blog. The idea that all information is known about the Gunn chief line is again shown to be wrong; this is the first time these source documents have been mentioned in Gunn historical terms. I have now shown that both Esther Gunn and this ‘Unknown’ Gunn have lines which could provide the Gunn Chief by direct descent, but which is the more senior is an interesting issue. Both Esther and ‘Unknown’ have living descendants. This is again one of those rare items; a primary source document relating to the Gunns which seem to have not been explored before. I have not finished deciphering it all. William Gunn, of Kinbrace, took on Achnahow in Kildonan from the Earl of Sutherland in 1658. This provides support for the clarification of the Kinbrace line. It seems likely that his wife (previously not known) was Anna Cordover? Given the lack of a married name was the added land in consequence of what she was bringing in to a marriage? William Gunn and Anna ??????? So making the line Donald - William - Adam - William all of Kinbrace, This makes the start Donald the Scholar. So it's now a very clear line of descent for this important Gunn line. Mark Rugg Gunn (page 167) states that William Mor may have given Kinbrace to his 'younger brother William beag on wadset for 800 merks'. This is highly questionable. Firstly the Sutherland Estate owned the property; the Gunns did not. 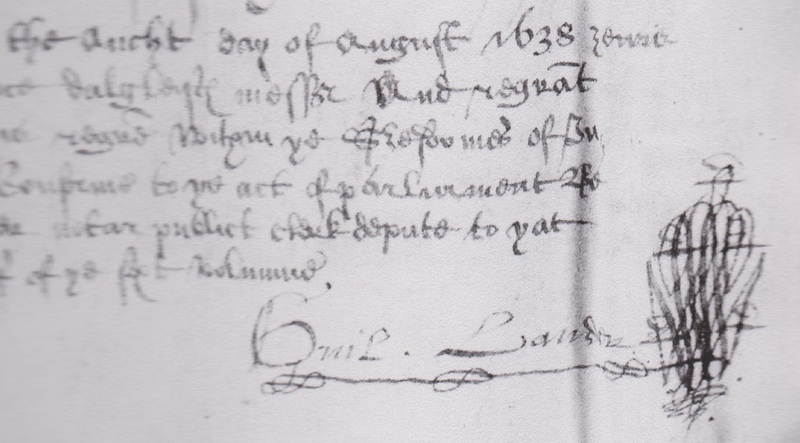 The lease / wadset would have been in the name of a particular person - note the above documents. It would not be up to the Gunns to pass the leasehold on; the owners of the land had that right. 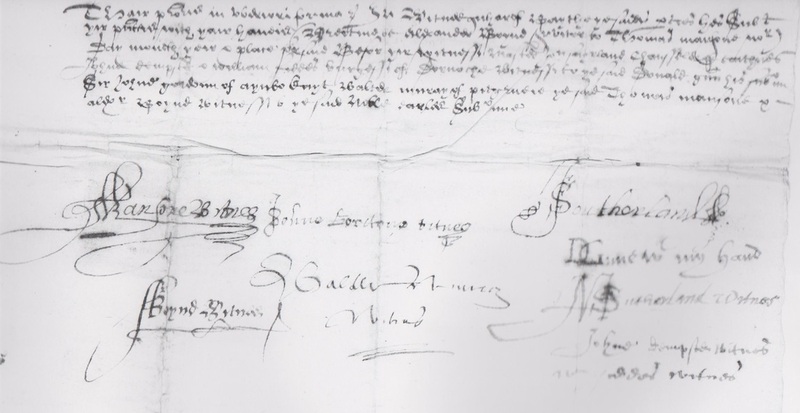 Secondly I have examined two 1638 documents which concern the leasing of the lands of Kinbrace to Donald Gunn; presumably the son of William beag. If the land had been able to be passed to his father why does the son then need to get the leasehold from the Sutherland estate? He would not so need to do - which means his father did not have that wadset. The bottom right corner reads 'lands of Kinbrays' being the spelling of the time in many documents. The clear August 1638 of the document. This provides a clear date for Donald the Scholar to be an adult. The detailed witnessing of one of the 1638 documents clearly showing the legalities of the time; the idea that the Estate was a law unto itself was not true. Donald Gune (how he spelt it) is second on the right hand side. Note he also adds 'in my hand' suggesting that he was new to literacy. Why else state it? It is worth noting that this Donald Gunn is 'Donald the scholar'; perhaps the acquisition of literacy shown here is enough to separate him out from the other Gunns of the time?